Boston needs to hold serve and preserve home field with a win to guarantee that they can get the series back to Boston for a Game 5 if necessary because the Yankees have turned their building into an imposing place to play in the postseason. The Yankees went 6-0 at Yankee Stadium in last season's playoffs, and beat Oakland in the Wild Card Game on Wednesday. Boston Manager Alex Cora said of the importance for his club to take a 2-0 lead in the series, "It's very important. They haven't lost a playoff game in a while there. The three Wild Card games. They swept the Astros last year. So it's a tough place to play. Last year that place was alive, the fan base. We played like 4:00 games or 5:00 games, from 3:00, from the get-go it was loud. "I know the rivalry and everything, we played some games there and it's been loud, but nothing like the way it's going to be on Monday. So it will be good to go 2-0 there. And take three shots to win one." 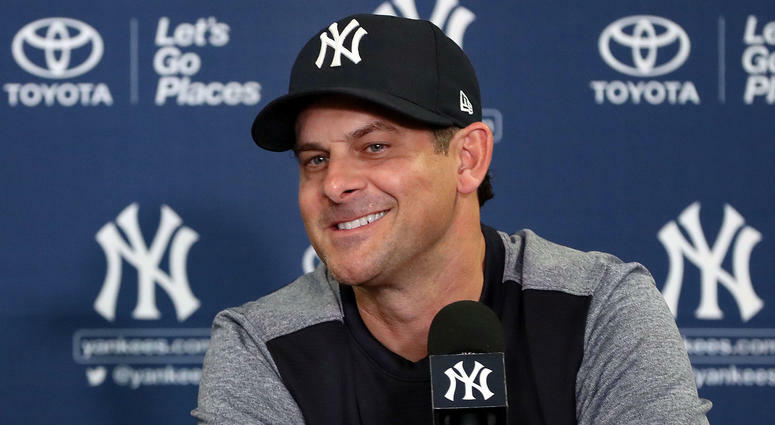 Yankees Manager Aaron Boone said, "I think our fans have been unbelievable. That's something that really stood out to me from afar last year, just watching it on TV. And I think I talked about this a lot even in my opening press conference of the year. It seems like the Yankee fans and this now new generation of Yankee players, you know, past the '90s and the Jeter years and all the success that team had, I feel like now the connection our fan base has with the Aaron Judges and Gleyber Torres and these guys is a special one. And I think it manifests itself in our ballpark on a nightly basis during the regular season, certainly in the postseason. "I think our ballpark is set up for us as a team that's very good. Our right-handed hitters are using their power the other way. But we feel like we get a really big boost at home just based on our fans and our ballpark, and I think our guys walk out there probably with a little bit of extra swagger when we take the field there." AARON BOONE: No question. More than serviceable. I call him a shutdown corner out there in the outfield. He's a great defender. And we know he's going to give us quality at-bats. Yeah, there's a lot of comfort in knowing we've got Gardy there that can step in. Again, Aaron will be hot tonight and I wouldn't hesitate to use him in a big spot, if the situation comes up. AARON BOONE: I think it's really valuable. Those are two guys that have come up with a lot of eyes on them, a lot of expectations. Obviously big prospects in the game coming into this year, and they have delivered. Not an easy place, you know, to come into a really good team and have the kind of impact that they have had this year, have shown the ability over and over again to make adjustments, and really handle the ups and downs, even in a great season that are inevitable. They've done a really good job with that. And now this is another step for them in their continued development. And I feel really good that they're capable and equipped to have success in this environment, too. Q. Without Hicks there are obviously a lot of permutations you could have gone through - with the lefty on the mound, you could have put Stanton in the outfield. Anything you considered that way? AARON BOONE: A little bit, but also feel good about just the kind of defender Gardy is. Here to go out and play center field there, and obviously what it means to our club and just having his at-bat quality at the bottom of the order. He's faced David a good amount in his career, and just felt like he was the guy that we want out there. Q. There's so much talk in Boston about David Price's playoff woes. Brett Gardner mentioned last night it doesn't matter who is pitching, you guys want to knock him out as quick as possible. Is that in the back of your mind you talk about or it doesn't matter? AARON BOONE: Yeah, Marcus, P.J., the guys, they'll have a game plan going in, and our focus is to go execute it and go do damage. Hopefully we can go out and have success tonight against a really good starting pitcher. Obviously we're very familiar with him. We've had a fair share of success, but that doesn't guarantee anything. But we'll come out tonight expecting to play well and to perform, and hopefully that means being able to get him out of there at some point and putting runs on the board. That's our expectation. AARON BOONE: I don't know. I think you look back on it and it all gets logged in as experience. You take good things and bad things from it, and hopefully grow from it. In looking back, you know, you can't ask for much more as a professional athlete to be playing on this kind of stage in this kind of environment, whether it's at home in front of our fans or coming on the road in a hostile environment against your rival. I mean, this is what it's all about in a lot of ways. To be able to play in these kinds of games is a privilege, and you also understand that this time of year it's a tremendous opportunity to -- we're all here to chase the ultimate prize. That's now begun. To get to play here in this venue is special. Q. Aaron, in a short series what does a manager do if a team falls behind 0-1, like you guys are in? It's not a situation where you spend a lot of time talking to guys and stuff. Do you go about your way and keep things as normal as possible? Does a team take the cues from the more veteran guys in the clubhouse? How do you feel about making sure everybody is kind of all together? AARON BOONE: Well, I mean, that's part of my job, is to make sure to get a read on that. There's times when I feel a need to say something. There's times I have conversations with individuals. That's part of my job. But I'm not worried about our group. We understand, you know, in the best-of-five there's -- you want to win. But I also know, and I feel like our group overall is in a really good place. We lost last night's game, but gave ourselves an opportunity, fought back. I felt like did a lot of really good things in that game last night. Again, just weren't able to get that big hit that allowed us to climb all the way back in. But I feel like our guys' frame of mind is strong. I feel like our expectation is strong. And I feel like it's a confident team that's going to walk out on that field tonight.